RUGBY LEAGUE: Rugby league clubs are central to our communities in the South Burnett, with children as young as five pulling on their club's jersey and running out on the field with their teammates. Through the sport, players learn the importance of dedication to their team, to trust their teammates and respect their coaches and mentors. Children live and breathe rugby league and their teammates and clubs become a second family and shape the men and women they grow up to become. These junior players then look up to the senior players in the club and look to emulate their behaviour on the field and off it . Cole Cooper from the Murgon Mustangs loves his footy. As a former player and father of two boys who play, he sees the potential of educating kids on issues through league. 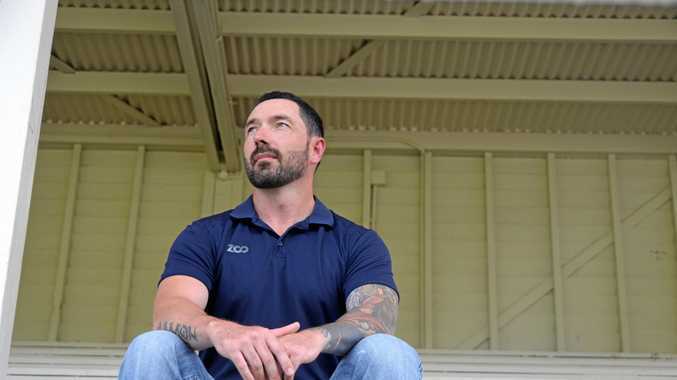 Cooper is head of the Murgon Mustangs Domestic Violence Awareness Committee and hopes to raise awareness for domestic violence through the Mustangs' new nines competition, to be played in Murgon on May 19. "Last year the idea came up when I saw on TV that the Federal Government brought in all that money for funding to help with domestic violence and I thought using rugby league and the club would be a good vehicle to get that out in the public and we are able to connect with all the schools that way as well," he said. Murgon has invited Kingaroy, Nanango, Wondai, Cherbourg and Eidsvold rugby league clubs to take part in the competition, with the A-grade teams to go head-to-head. Before the nines competition starts, South Burnett juniors will take to the field and there will be entertainment for the kids. "There will be plenty of activities, refreshments and food available on the day, while the future stars and current champions compete," Cooper said. In addition, the South Burnett under-18 side will take on Warwick and the under-16 girls South Burnett side will play Hervey Bay in regular 80-minute games. The club is dedicated to raising community awareness around this issue and committed to helping break the silence around violence. In 2017 the club hosted the Cherbourg Hornets during their domestic violence awareness round and the event was a success in starting the conversation. This year the club is hoping to make an even bigger impact. The club has brought together a number of organisations and domestic violence stakeholders to assist in raising awareness. The club has rallied the support of Uniting Care Community, Mudjimba Safe House and the NRL through their Voice Against Violence Program for the initiative. There will be 100 modified games of rugby league played on the day and there will be organisations on the ground to educate the community about domestic violence awareness. In addition to the day of rugby league on May 19, NRL legend and former Kingaroy Red Ant Matthew Ballin, along with fellow NRL stars Alan Tongue and Clinton Toopi, will visit local schools and clubs as part of the NRL's Voice Against Violence program. They will get students outside with a footy in hand and help them understand the issue of domestic violence. "Football is a big part of Murgon so it is an easy way to get the message to the kids and into the schools," Cooper said. Ballin, Toopi and Tongue will visit Nanango, Kingaroy and Murgon high schools as well as the under-18 South Burnett team and the under-16 Murgon side on May 17 and 18. A program will also be carried out at Murgon and Cherbourg primary schools by the NRL development team to break down the issue and educate young children. The day is alcohol-free and organisers are welcoming everyone from the community to come and see the best the Burnett has to offer. It is a free event for the community featuring 12 hours of rugby league and Cooper is encouraging everyone to get behind the event and spread the message and raise awareness for domestic violence.